Gergana’s story is so amazing that I still shake my head in wonder every time I think of it. Gergana heard me on an Internet telesummit in March of 2013 and booked a 15-minute Career Card reading with me. We talked via Skype, because she was in Bulgaria and I was in the United States. When we spoke, she told me she was bored, frustrated and depressed. She didn’t know what to do with her life. She asked me if the Cards had any insight into what she should do. As soon as I picked up the deck, the Artist card popped out. I asked her if she had any artistic ability. She laughed, as if that was completely ridiculous. “Oh no,” she said. “I have no talent at all.” I put the card back, and shuffled the cards as we talked. To my surprise, the Artist card popped out again. “Okay,” I said, “but the Cards think you do.” I put the Artist card back in the deck and shuffled it again. To my disbelief, the Artist card appeared once more! The odds of that happening are 1: 343,000 — Gergana is twice as likely to be struck by lightning than to receive the same card 3 times in a row. At that point, I told her that the Career Cards were certain that she was a Divine Artist. I saw her painting, and had a vision of her selling her paintings along a sidewalk. Gergana wasn’t having any of it. “I am not artistic at all,” she protested. “I have no talent, and no desire to do anything creative.” Now in middle age, she told me that she had never done anything artistic in her whole life and wasn’t about to start now. Shortly after that, Gergana took my advice. She took a painting class. Coincidentally, the Career Cards set arrived on the day of her very first painting lesson. 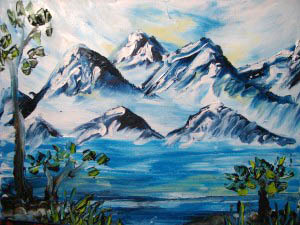 This is Gergana’s first painting — a finger painting. 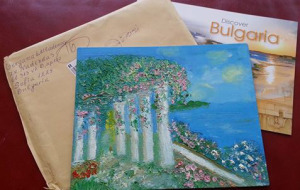 As time went on, Gergana posted several of her paintings to a new Facebook page she created to showcase her work: https://www.facebook.com/anagregart. 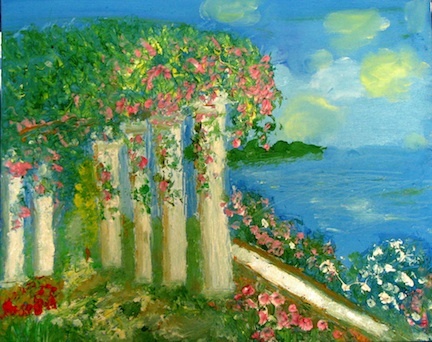 I especially admired a painting of columns adorned with beautiful spring flowers. I fell in love with it so much that I made it the wallpaper on my laptop. When I told her how much I loved it, she sent me the actual painting! What an amazing gift, to be blessed with something so beautiful by someone who had no idea she could even paint! “I am painting almost every day and this is such a great pleasure for me. I feel so joyous doing this. WHAT IS WAITING TO HAPPEN FOR YOU? Book a Reading And Find Out Today!